When you’re developing your MSP business marketing strategy, remember to include credible testimonials. They improve the trustworthiness of your business, building trust among your target audience. Testimonials can increase sales by humanizing your business with personal, believable feedback from your customers. In fact, a survey by Dimensional Research showed that 90% of purchases are influenced by reviews and endorsements. When potential customers read your testimonials, it lowers their anxiety about purchasing your services and excites them about what you have to offer. Publish your testimonials throughout your web pages and social platforms. Your readers are more likely to believe what customers have to say about your product, than what you say about it. • Home page – Let your customers see what satisfied customers have to say about your business as soon as they click on your home page. This will have an immediate positive impact on how they view your services. • About us page – Since this is the page that describes your business goals, it’s the most relevant page for testimonial placement. • Selective pages – Organize your testimonials according to similar benefits for your target audience. Place these testimonials on pages that relate to the specific content, for example product services pages. • Emails and newsletters – Always put one or two testimonials into all your communications with your prospective customers and target audience. When you choose which testimonials to publish, select the ones that emphasize the benefits of your services. You should have testimonials for every specific benefit of your MSP services. Effective testimonials show your prospects that others received the types of benefits that they’re thinking about buying. They want to know if your business helped others who had the same concerns and problems that they do. If you haven’t taken advantage of testimonials as a powerful marketing tool, start now. Send an email to your loyal customers, asking them for testimonials. If they’re happy customers, they’ll take the time to share their experiences. It takes time to collect enough testimonials to publish on your online sites, especially if you leave it up to the customer. To build up your testimonial inventory quickly, don’t hesitate to ask customers for testimonials. Develop a few questions you would like answered for the testimonials and send them to your client base. Ask them to write a couple of paragraphs about the sales process and the benefits of your services. The best time to ask for an endorsement is during the first few months after the sale. This gives your customers time to use your services and form an opinion about them. Update your questionnaire regularly to receive a variety of quality testimonials. Make sure you ask them for permission to publish the testimonial on your web pages and other promotional platforms. If you continue to update and add keyword rich, quality testimonials to your website, it boosts your search engine ranking, as well as building your MSP business social proof. 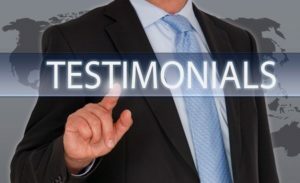 As you read through your testimonials, you also gain invaluable knowledge about what your customers expect from your business, and how you can improve to meet their needs.